It is also a realistic vision. In some ways, in fact, it is already here. Semantic Web standards and technologies are maturing, several tools exist, and new applications are frequently emerging. Similar to the early days of the existing Web, the vision awaits only understanding, acceptance, and perhaps a few "killer apps" that will deliver on its promise and prove its transformational value to the world. This is the first of a series of articles written exclusively to help the Semantic Focus community understand the Semantic Web vision and technologies. If you are new to Semantic Web concepts then you might have at least learned how unforgiving and overly academic the existing material can be. At least, that is what I have always thought, but I may just be a dunce. While I do not claim to be a guru, I know that I can help those of you who may be taking your first steps. I will deliver a logical progression of concepts designed to get you up to speed as quickly and painlessly as possible. I hope to deliver one part of this series per week using a version of the Semantic Web technology stack as a framework. The stack (aka the Semantic Web layer cake) is a rather famous illustration of the key Semantic Web enabling technologies. Building one upon another from bottom to top, these technologies can help us realize the full Semantic Web vision. To my knowledge, all of these exist in various forms of maturity and you can now use one, some, or all of them to empower your ideas. Understand and articulate the Semantic Web vision. Know the basic framework and core technologies. Be aware of some available tools. Understand how mature the technology is and how you might (or might not) use it today. Get involved for further learning, contribution, or just plain geek fun. So, let's begin at the beginning — the part where everyone at some point or another asks, "What is the Semantic Web?" 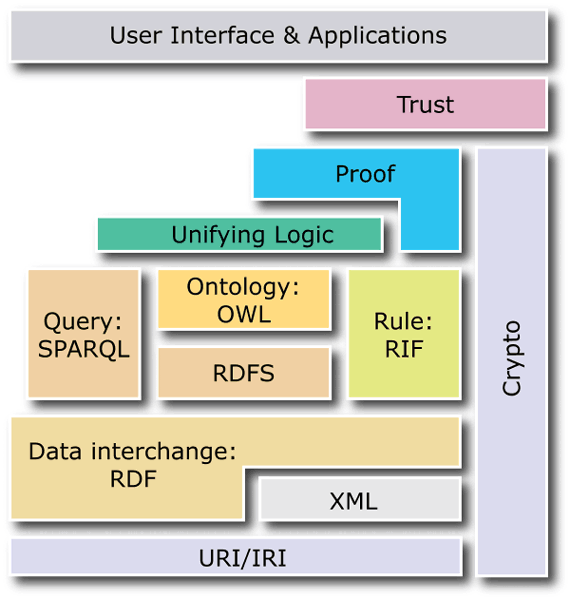 The Semantic Web is a vision for the future of the Web, a "Web of meaning" (i.e. semantics), that was set forth by Tim Berners-Lee. Sir Berners-Lee is often referred to as the father of the Web. He's sort of like that white-bearded old man in Matrix Reloaded (the one who says 'ergo' a lot — the Architect) only not as pompous: "I just had to take the hypertext idea and connect it to the TCP and DNS ideas and — ta-da!" He's the man who originally wanted to establish this single global space to create the World Wide Web and that's how HTML and HTTP came into existence. He went on to establish the World Wide Web Consortium (W3C) and then later thought of embedding large amounts of machine-understandable metadata into documents; this is what gave rise to the Semantic Web. You see, most of the Web's content is designed for humans to read and it is not very easy for computer programs to manipulate that information meaningfully. Though the information is semi-structured, the structures typically only defines how content should be rendered in a client browser. HTML does not inherently tell us anything about the subject and nature of the content. So, the idea is to come up with some standard ways to express better meaning around information so that computers can help us use the information more effectively. This simple idea is the very essence of the Semantic Web. Imagine a scenario, for example, where software agents can roam the web and carry out sophisticated tasks on our behalf. This is different than searching content for keywords and popularity. It is a web where computers are able to infer meaning from content based on metadata and assertions that have already been made. It is a web where information can be automatically classified and related through the help of reasoning engines and description logics. Or, in a more practical sense, it's a web where services can be found, integrated, and invoked more easily and more dynamically. Some like to call this scenario "Web 3.0." Others have called it the "dark web" (where computers are using the Web more than we are; churning through information for our foreground benefit). Some people, of course, do not agree with it at all (believing it to be overly ambitious). Others interpret it on sci-fi tangents (i.e. a one-brain global intelligence and what-not). Is a vision for the future Web (a web of meaning — semantics); originally defined by Tim Berners-Lee (aka father of the Web). Is not a separate web, but an extension of the current one. Provides a way for machines to get much better at being able to process and understand the data that they merely display at present. Is a web on which machine reasoning can become ubiquitous and powerful. Describes an emerging set of standards, markup languages, and related processing tools. Is a rolling snowball; interest and momentum is building fast — heads up! If you want to be persuasive, you might also add that according to the 2006 Semantic Conference, semantics is already a 2 billion per year market and is projected to grow to over 50 billion by the year 2010. That's 20 billion more per year than the market for pizza — yum! The first steps of weaving the Semantic Web into the structure of the existing web are indeed already under way. The foundation has been laid; the rest is up to us. To realize the vision, however, we must begin understanding it on a much deeper level and we've got to roll up our sleeves to get our hands dirty. That is exactly what we'll start doing next week when we dive into the layer-cake to munch on the basic enabling technologies such as Unicode, URI, and XML. Until then, enjoy your work and the Web; it is an exciting time to be alive!